The Sir Reginald Ansett Transport Museum is based on the Ansett company’s first aircraft hangar. Centrepieces of the display are a Fokker Universal aircraft, similar to the one used on the first Ansett flight in 1936, and the 1928 Studebaker. Other memorabilia includes documents from the early days of the Ansett empire. Of particular interest is the company’s first prospectus which sets out the capital required and proposed development of the company. Other items, like a Boeing 727 wheel, graphically illustrate the rapid advances in flight and road transport operations. The museum now has a complete set of flight attendant uniforms and an array of smaller items to keep the nostalgia buffs busy for quite some time. The museum committee has ensured the memorabilia on display conveys the company’s rapid growth from a single vehicle road service to an international airline. Interesting display available to view. 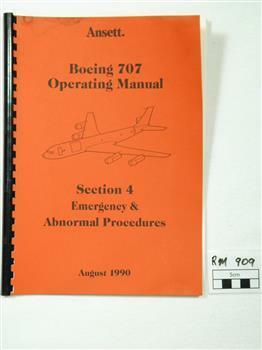 Comprehensive updated of emergency procedures by Captain Hanrahan as Manager Flight Standards, of the Boeing 707 aircraft.Check List of "Emergency Procedures" Boeing 707 Passenger Aircraft Engine Failure, Fire, Aircraft Systems Failures.